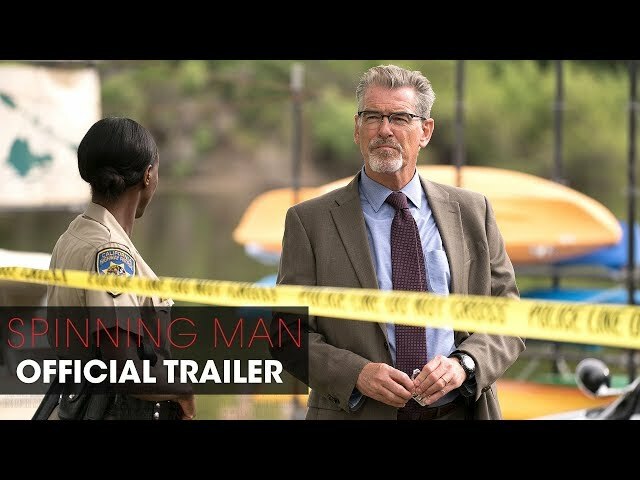 Spinning Man (film, 2018). A 2018 thriller film with "R" rating by Lionsgate Premiere. Directed by Simon Kaijser da Silva. Official Trailer. Spinning Man is a 2018 thriller film directed by Simon Kaijser da Silva. 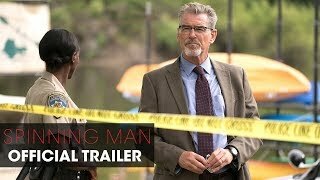 Spinning Man (2018 Movie) - Official Trailer - Pierce Brosnan, Guy Pearce, Minnie Driver. Evan Birch (Guy Pearce) is a family man and esteemed professor of philosophy at a distinguished college. When a female student at a nearby high school, Joyce, goes missing, Evan's previous off-campus dalliances cause his wife (Minnie Driver) to question his alibi. Meticulous police detective Malloy (Pierce Brosnan) has even more reason to be suspicious when crucial evidence makes Evan the prime suspect in Joyce's disappearance. Suddenly, the questions Evan faces aren't merely academic - they're a matter of life or death. The film Spinning Man was scheduled to be released by Lionsgate Premiere on April 6, 2018 (United States). The film's budget is $8.5 million. Spinning Man got average rating from critics. The audience dislikes the film either.